The Model 3051 Piezoelectric Accelerometer exhibits a nominal transfer sensitivity of 20 picoCoulombs/g. The moderate sensitivity, wide frequency response, and wide operating temperature range provides a device well suited to a broad range of low to medium level vibration measurement applications. The mechanical isolation of the seismic elements from the mounting structure optimizes this unit for low frequency data measurements, while the glass-to-metal hermetic seal and the welded construction permits its use in the most adverse industrial environments. Ground is electrically isolated from the case for reduced noise pickup. 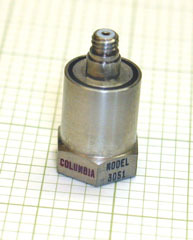 The Model 3051 features a 10-32 top connector and is provided with a 10" low-noise coaxial cable.